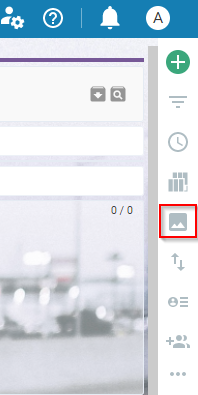 Note: if you don't see the Board Background icon (Image 1) on your account, means you are running on version 5.17 that is maintenance mode only. To add a background to your dashboard, please refer to the following article (5.17). Please, contact csm@kanbnzie.com for an upgrade to Kanbanize version 6.0. 1. How to personalize your Board Background? With the Board background feature, you can make your workflow more stylish and flamboyant by adding an image or set a color as a background of your board. You can upload the image from the great selection of quality photos available in the Unsplash gallery we are now integrated with. - From the top "Board Colors" panel, users can select a color that will instantly appear as a board background. 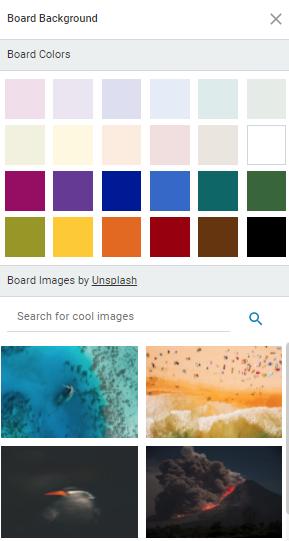 - To upload Board images by Unlash-> select one of the available photos or use the Search option to look up for a photo by a keyword. For example "landscapes" or "cars". Select the image you like most and it will appear discretely behind your board layout in contrast with the section/columns, lanes and cards. Note: To remove the background image or color, just select the white color from the color palette. The boards ordering on the dashboard is optimized for better visibility and overall structure. The boards are placed two in a row below the project and the background you’ve chosen is also reflected there. Note: if you want to personalize your Dashboard, please read the following dedicated article.